Situational sea awareness (SSA) is a field of applied oceanography that relies on operational oceanographic products (analyses, re-analyses and forecasts) to inform users about environmental conditions at sea, including early warning for marine extremes and hazards. The key is to develop information technologies capable of disseminating user-oriented information that is based upon rapidly changing data from wind, waves and current forecasts. Situational sea awareness is useful for all maritime operations, from ship routing to search and rescue, offshore hydrocarbon exploration and fisheries, where the knowledge of the environmental conditions is required to carry out operations at sea safely and efficiently. The environmental data of interest are the meteo-oceanographic analyses and forecasts as well as the related positions of objects and substances in the whole water column. EMODnet initiative aims to provide access to European marine data in an interoperable and free of restrictions way. EMODnet Chemistry lot focuses on the fulfillment of EU MSFD and INSPIRE directives requirements to assess eutrophication and contaminants. It could play two main roles: provide standardized and quality-checked buffers of data for specific regions and act as an umbrella for standards, best practices, and infrastructure to aggregate at regional level the single member states. Updated situational sea awareness requires an advanced technological system to make data available for decision makers, improving the capacity of intervention and supporting users in managing emergency situations due to natural hazards. The TESSA data platform meets the request of near-real-time access to heterogeneous data with different accuracy, resolution or degrees of aggregation providing efficient and secure data access and strong support to operational oceanographic high-level services. The present work describes an operational strategy for the development of a multiscale modeling system, based on a multiple–nesting approach and open–source numerical models. The strategy was applied and validated for the Gulf of Taranto in southern Italy, scaling large–scale oceanographic model results to high–resolution coupled-wave 3-D hydrodynamics simulations for the area of Mar Grande in Taranto. The spatial and temporal high-resolution simulations were performed using the open source. This study shows the capability of the numerical model in reproducing the trophic index (TRIX) calculated from in situ data. The ecosystem simulations can represent an important support for monitoring activities, allowing the use of TRIX to be extended to larger areas where in situ sampling activities are difficult to implement. The model TRIX was calculated for the whole Adriatic Sea, showing trophic differences across the Adriatic Sea. In March 2014, a commercial airliner vanished without a trace. The main wreckage of the plane was never recovered, except for some small parts that washed up more than 17 months after the disappearance. In this paper we show a method to model the most likely trajectories of floating debris from the aircraft. 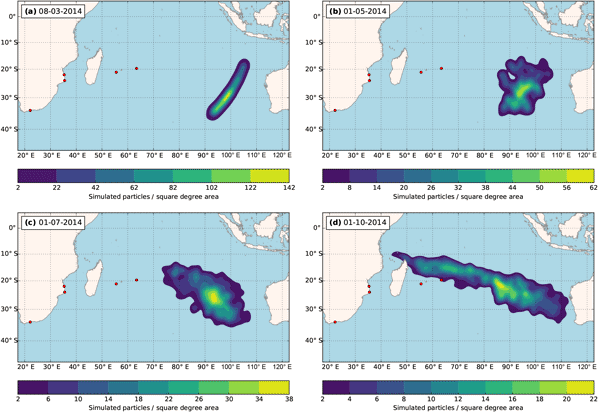 The results show that the assumed area of the crash site is compatible with the recovered debris and predict that further debris may be found along the African east coast. This paper examined the performances of two operational ocean forecasting systems, Mercator Océan in France and SCSOFS in China, based on observed satellite and in situ data obtained in 2012. The comparison and validation are focused on the ocean circulations, the structures of temperature and salinity, and some mesoscale activities in the South China Sea. Finally, some recommendations have been proposed for both systems to improve their performances in the near future. This work explored the importance of considering the tidal dynamics when modelling the general circulation in the Messina Strait, a narrow passage connecting the Tyrrhenian and the Ionian Sea sub-basins in the Western Mediterranean Sea. The results highlight that tidal dynamics deeply impact the reproduction of the instantaneous and residual circulation pattern, waters thermohaline properties and transport dynamics both inside the Messina Strait and in the surrounding coastal and open waters. This work presents the comparison of two modelling suites (TELEMAC, MIKE21) in fundamental wave-hydrodynamics applications, and proposes a multiparametric approach for the rapid assessment of wave conditions in coastal zones. Study areas for all applications are located in South Italy. Analysis shows an overall satisfactory agreement between the two suites and provides useful insights on their capabilities, while the proposed approach was successfully implemented as part of an operational chain.